Having won the BBBoC Celtic title in his last outing, Derry Jr. Featherweight Tyrone McCullagh [11(6)-0] will face the English champion next. It has been announced this evening that ‘White Chocolate’ will face English beltholder Josh Kennedy [11(5)-0] on the big Belfast BoxNation show at the Titanic Exhibition Centre on Friday October 5th. The vacant WBO European rankings title will be on the line in six weeks time and a win for McCullagh would likely see the Irishman join the organisation’s Top 15. The current WBO champion is Ghanaian Isaac Dogboe who defended his belt for the first time on Saturday night, stopping Hidenori Otake of Japan in the opening round. 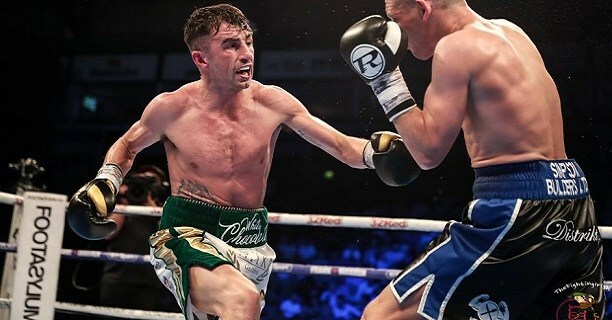 Last time out 27-year-old McCullagh outpointed Glaswegian Joe Ham on the Mick Conlan Homecoming undercard to become the champion of Ireland, Scotland, and Wales. The Foylesider, a European bronze medallist in the amateurs, dominated for much of the bout – bar a brief trip to the canvas late in the third round. ‘Handsome’ Kennedy won the English belt last year, edging South African Michael Ramabeletsa on a split decision having being dropped in the seventh round. Previously the 27-year-old had stopped Jamie Speight in the third to win the Southern Area featherweight belt and since the Ramabeletsa win he has outpointed Michael Barnor and Bobby Jenkinson. The October 5th card is headlined by a heavyweight clash between Dubliner Sean Turner and Liverpool’s David Price alongside an all-Irish super featherweight clash between Declan Geraghty and Marco McCullough. The undercard features Steven Donnelly, Steven Ward, Padraig McCrory, Conrad Cummings, Sean McComb, Gary Cully, and World-rated Aussie Nathaniel May – who is of Belfast stock.